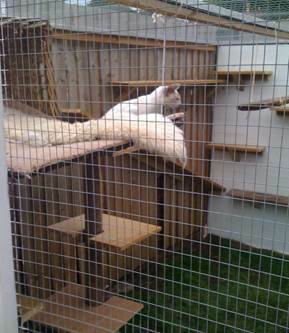 Outdoor cat run furniture is an essential ingredient for any outdoor cat enclosure or cat run. 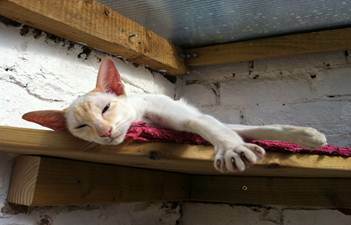 Cats enjoy a safe and stimulating outdoor area to exercise and engage in their favourite feline behaviours such as stalking flies or sleeping up high in a sunny spot. After building our cat run, we wanted to create it into an environment that provided challenge, exercise and interest for the cats. A little careful thought transformed our run from a dull space like our before photo on the right to an exciting area that the cats love to be in like this below. 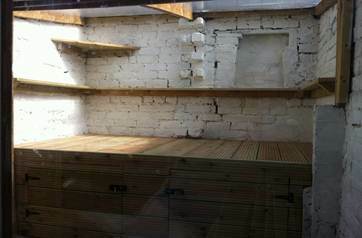 A decking base already provided the perfect raised sunning area and with a clear perspex roof it became a real sun trap. The next step was to add the ‘furniture’. 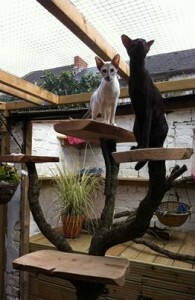 Commercially built outdoor cat trees are available but we found it much cheaper to build our own to suit our space. We found a local company that were able to supply us with responsibly sourced oak tree stumps and branches. Tree surgeon companies are usually happy to let you have branches they are disposing of or you could try your local forestry if you are not lucky enough to have trees in your garden you can use. 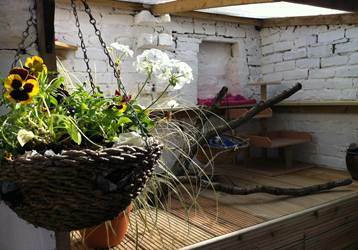 We used interestingly shaped and forked branches to create climbing areas and screwed in decking or hard wood planked platforms for look out spots and beds. Hardwood will last outside with no need for chemicals or treatment and will become stronger with age so using quality hard woods is a good investment that will save you money in the long-term. The branches were then either laid across the decking or screwed into decking bases to create upright trees. To add scratching areas, we wrapped sisal rope around the tree branches. You can find this rope easily in garden centres or buy it online. By soaking the rope first overnight, before wrapping it round and stapling every fourth coil, ensured we had a nice tight fit as it dried. 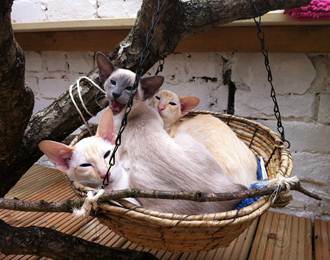 Finally hanging baskets were positioned to hang from the trees creating cosy beds that your cats will not be able to resist. I secured the hanging baskets from the t op and sides to ensure they were stable for the cats to climb in and out of without swinging too far. You will find the hanging baskets become popular spots for one, two, or three cats, or however many can possibly squeeze in. 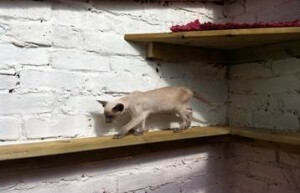 Shelves of different heights and widths ran along the inside walls of the run to encourage the cats to exercise, jump and climb. Cats naturally enjoy being off the ground and mine spend many hours traveling around the pen using the shelves and never touching the ground. We used pressure treated decking boards that would be long-lasting and durable for the outdoors. A strip of 3×2 inch timber was attached to the wall of the pen where the shelf would run. Then the decking board was attached to this. 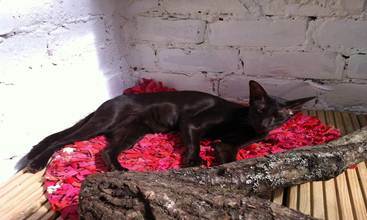 Diagonally angled supports between the shelf and the wall added extra strength; essential for larger breeds of cats or where several cats will be using the shelf at once. We positioned the shelves to allow for challenge to make an interesting environment for the cats, using varying heights and widths of shelves with gaps that cats could jump across, straight sections to run along and steeply sloped inclines between shelves of different heights. 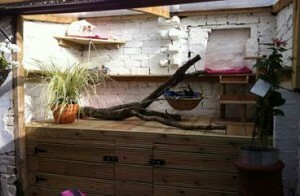 A plank was also hung from the roof of the run to create a sky walk for the cats. When making this, be careful to hang it from the roof stretched between two or three attachment points at each end to ensure it doesn’t swing too much and scare your cat. Platforms can also be created along the shelving for a quick cat nap or snooze in the sun. We provided lots of different sleeping and sunning areas to ensure there was plenty of space for all the cats. This is particularly important in a multi-cat household where competing for resources or sleeping areas can cause friction between cats. Of course, the highest sleeping points are always the favourite and my cats all love the corner shelf we placed in the very top corner of the run underneath the perspex roof. 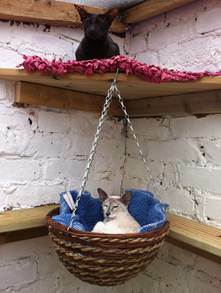 A basket hanging from the shelf creates a perfect double sleeping area. This hanging basket butts against a shelf running along two sides which holds the basket steady and stops it swinging too far. A few carefully chosen and positioned plants are the perfect addition to a cat run. 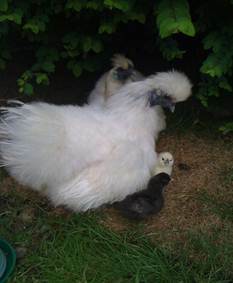 Plants provide shelter, a comfortable bed, something to stalk round or something to chew! 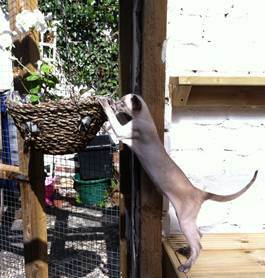 Plants can also add interest for the cats by attracting butterflies to watch and chase. Preferably, cats should have access to grass as it is a vital aid to digestion and helps the regurgitation of furballs. Cats are obligate carnivores meaning they need to eat meat, however most cats will enjoy the option of a little greenery in their diet in the form of grass or a nibble of plants. Care must be taken that plants provided in the cat run are safe for cats to eat; advice and a list of toxic plants for cats can be found here. Grass can be provided in a tray, planter or small bed, and may need to be replaced regularly depending on how much your cats enjoy it. Rolls are turf are available very cheaply at garden centres making it easy to replace the grass with very little cost or maintenance. Cats will happily trim the grass for you, or allow it to grow and the cats will love stalking and hiding in the long grass. 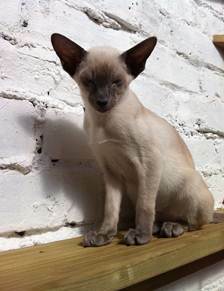 Ornamental grasses are also available from garden centres although be careful which species you choose as not all are safe for cats, particularly cordyline (palm lily) that is toxic to cats. We have several pots of cortaderia (pampas grass) that looks attractive in several differently coloured varieties and it is considered non-toxic to cats. My cats love it and there is always a queue around it in the mornings when they first go out. 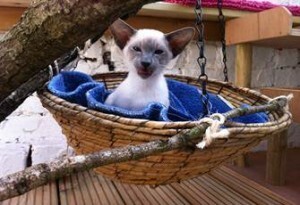 I space the pots with gaps between for cats to nap underneath the hanging foliage or play a game of hide and seek. Other plants that cats enjoy are cat thyme, lavender (that makes cats smell lovely when they brush against it), valerian and of course, catmint. Scented herbs such as thyme, rosemary, tarragon, lemon balm, mint, coriander and camomile will all add interesting smells for your cat to explore. Plants outside of the cat run can also add interest for the cats. Many cats enjoy the smell of honeysuckle growing outside the run and it will attract butterflies for the cats to watch. As a word of caution, honeysuckle berries are toxic and should be removed or out of reach for cats. A hanging basket of flowers will brighten the run and your cat will enjoy scented flowers that attract butterflies such as lavender, sweet william, pansies and buddleias. Be careful that this is out of reach to the cats or they may decide to have a nibble or sleep in it! Finally, now the inside of your run is decorated, give a thought to what is outside the run. Cats love to watch the world go by and the more interesting we can make it, the better. Plants to attract butterflies are excellent or you can encourage birds to visit your garden by positioning a bird feeder near the run and safely out of reach of the cats. Or even a rabbit or a couple of free range chickens pottering around the garden will provide hours of entertainment for any cat. Excellent ideas and suggestions Jo! Now I am going to put my hubby to work!